Record Turnout For Pope's Sunday Mass In Manila : The Two-Way Francis concludes his four-day visit to the region's only predominately Catholic country advocating for the poor and warning against the government's "insidious" family planning program. Pope Francis waves to the crowd as he arrives at Quirino Grandstand to celebrate his final Papal Mass in Manila, Philippines, on Sunday. In his homily, Francis warned about the Philippine government's "insidious" family planning program. 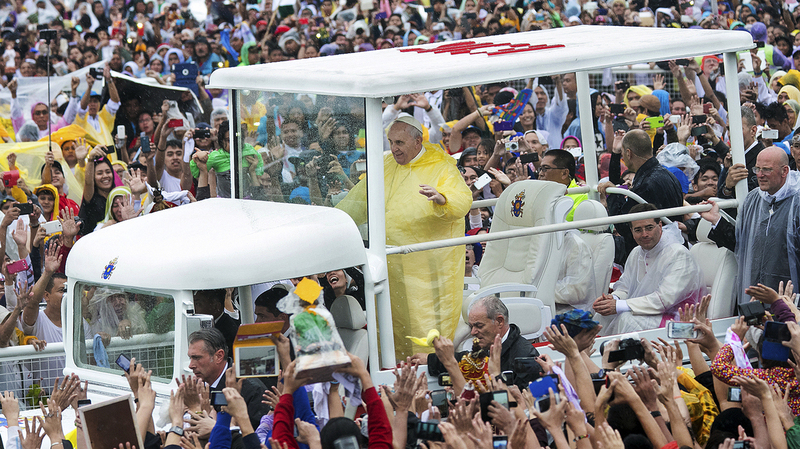 At least 6 million people in the predominately Catholic Philippines thronged a rain-drenched Rizal park in the capital, Manila, to catch a glimpse of Pope Francis as he presented Sunday Mass at the end of a four-day visit to the islands nation. Speaking to poncho-clad Filipinos standing in the pelting rain, Francis appealed to the world to "learn how to cry" for the poor and abused and urged ordinary people to "shun structures which perpetuate poverty, ignorance and corruption." The Philippines is among the poorest countries in Asia with one of the fastest-growing populations in the region. "We need to see each child as a gift to be welcomed, cherished and protected," Francis said in his homily. "And we need to care for our young people, not allowing them to be robbed of hope and condemned to a life on the streets." But the pope hit out at the Philippine government's program requiring family planning services at hospitals, warning against "insidious attacks and programs contrary to all that we hold true and sacred." Vatican spokesman, the Rev. Federico Lombardi said the estimates of the number of people attending the mass ranged between 6 million and 7 million, easily surpassing the 5 million who attended a final Mass in the same park given by Pope John Paul II two decades before. On Saturday, an approaching tropical storm forced the pontiff to cut short a visit to Tacloban, the central city that was devastated by Typhoon Haiyan in 2013. Before arriving in the Philippines, the pope visited Sri Lanka, an island-nation with a significant Christian minority that was also visited by John Paul II.